Mike Hailwood’s widow Pauline has spoken out after starting legal action against Ducati over the MH900e, or Mike Hailwood Evoluzione. She is upset over the use of the 10-times world champion’s name and the way the bike has been advertised and makes the points in a suit filed against Ducati in New Jersey. Confirming her decision to take legal action to motorcyclenews.com, she said she had hoped to settle the matter " quietly and amicably " but that Ducati had been unwilling to come to an agreement.
" The compensation amount is up for discussion, " she said from her home in Spain.
" What I’m doing is defending my right to use Mike’s name. 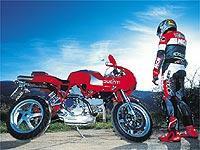 Ducati is taking away my right to use his name, and I have to protect the rights which my son, Dave, and I inherited. " Protecting rights to Mike’s name is vital to future plans, she says, which include extending the www.mikethebike.com virtual museum website and making it financially self-supporting, plus a possible real museum displaying Hailwood bikes and memorabilia.
" This did not have to become a public spectacle, " she said in an earlier statement. She claims that Ducati: " did not have the courtesy to contact me for permission to use Mike’s name. " Here’s her earlier statement in full: " Mike helped define an era. He was undoubtedly the best racer of all time, both as a person and as a sportsman. Ducati was looking for an icon to sell motorcycles.
" When someone of his stature is used to sell a product, inescapably, people interpret it as an endorsement. Ducati used Mike’s name to draw attention to the bike, and to make money from an implied association when there was none. The MH900e is not a bike Mike ever rode. Regrettably, many people think the bike is a replica. It isn't. It is separated by 22 years and a gulf in design and engineering from the bike Mike rode to victory in 1978.
" I have been very selective on how Mike’s name and image have been used. Clearly, I would not have approved an advertising campaign that states, " Somewhere Mike Hailwood is smiling... and shifting his Ducati into sixth gear. " I have spent two decades mourning Mike and Michelle’s tragic deaths.
" In this, the 20th anniversary year of Mike and Michelle’s passing, Ducati did not even have the courtesy to contact me for permission to use Mike’s name, much less seek my approval over the way in which Mike's name is used. This is no tribute to Mike. This is corporate greed at its worst.
" In 1999, before the MH900e was sold over the Internet, we contacted Ducati about the Mike Hailwood Virtual Museum, and the family's efforts to honor Mike’s memory. This was before Ducati announced production of the MH900e. Ducati did not respond. Adding insult to injury, they made no effort to contact me after I made public statements to the motorcycle press objecting to their plans to manufacture the MH900e and labeling it with Mike’s name.
" This did not have to become a public spectacle. Indeed, we told Ducati over three months ago that we hoped to settle this quietly and amicably. Regrettably, Ducati has been unwilling to come to an agreement to allow for just compensation and respect due Mike or his family. In the end, they said they had the right to use Mike’s name. And, by standing up for my rights, they said I had illegally interfered with their business or contractual relations with dealers. Due to Ducati’s inability to take responsibility for its actions, I was left with one unfortunate course of action. They gave us very little hope this would ever be resolved otherwise.
" It is not the easiest to put yourself in the litigation process. It displeases me greatly that I have to stand up to Ducati in this manner. Litigation is a last resort. But, I feel disappointed that Ducati felt that they could use Mike’s name with impunity. As a man, Mike stood for fair play and sportsmanship. I think that somewhere Mike is smiling proud that his wife and son are standing up for what is right and proper. " We expect to be able to add comments from Ducati, shortly.